Your viewing experience of the MusicMaster website, as well as the web as a whole, would be much improved if you upgraded your browser. 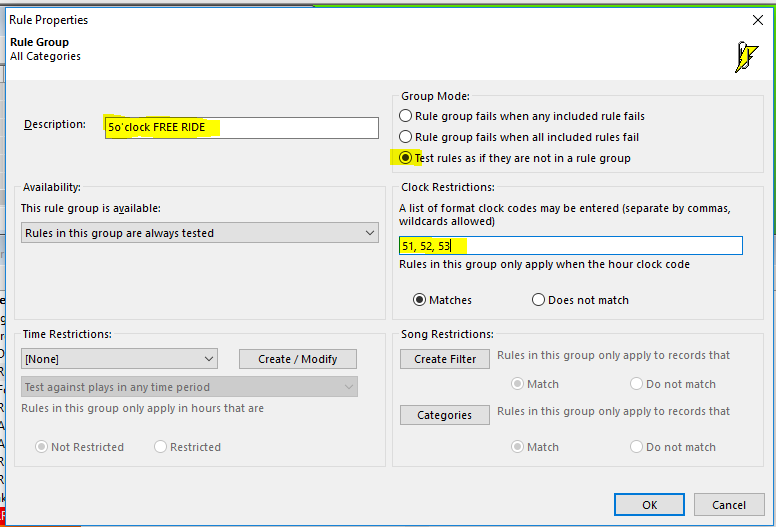 So, you have a 5’oclock Free Ride feature and you want specific rules to fit the hour. You want no slow songs, no buzz killer songs, right? Just music that will pick up the spirits of those stuck in the car, in rush hour traffic. With MusicMaster, if there’s a will there’s a way. Let’s go to the Rule Tree and set up some custom rules for your 5pm clock(s)! Go to: Dataset/Rule Tree or just click on the Lightning Bolt Icon. At the top right-hand side of the Rule Tree in Available Rule Types is the folder “Special Rule Tree Items”. Inside that folder is “Rule Group”. Pull the Rule Group over to the Unbreakable All Categories folder. The Rule Group properties will open up once you’ve dropped it in the folder. You only have a few clocks assigned to your 5pm hour so this will be quick. Next, go to the “Clock Restrictions” section and list the clocks you want to adhere to your specific set of rules for the specialty show. Be sure to separate the specific clock codes with a comma! 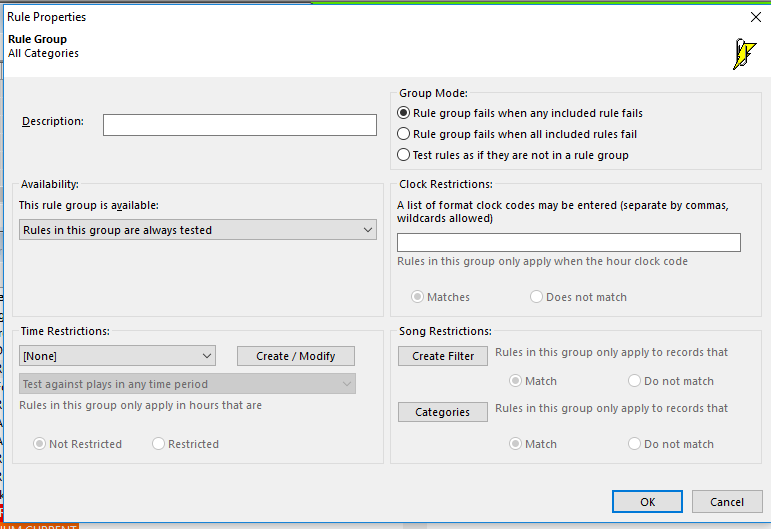 Click okay and your Rule Group is ready to fill up with specific rules for the show. Drag and drop your rules over the title of the Rule Group and you should see the lightning bolt next to the rule, indent a bit. If the lightning bolt isn’t indented, it’s not yet in the rule group. If that’s the case, drag it over the name of the Rule Group and it should tuck in for you. Save your Rule Tree and you are done! How easy was that? The beauty of this is if your specialty show ever moves to a different time, the rules will just follow the clocks to the new time. If you have any questions, please contact MusicMaster Support. Lots of stations do a 2fer Tuesday feature or other artist double-shots. Here’s how to do this in MusicMaster. 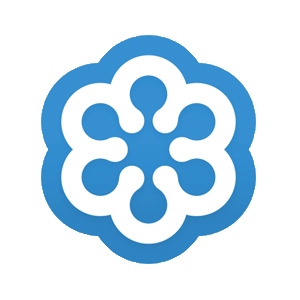 Start by going to Dataset/Library/Keywords/Artist Keywords, click Tools/Kickoff Category Wizard and follow the prompts. Check the categories you want MusicMaster to consult when determining which artists have enough music for a 2fer. Generally this would be your entire active music library, though some stations have a large Hold category with songs that could be used for 2fers as well. What is the “Format Scheduler”? In a nutshell, the Format Scheduler allows you to pre-schedule your Clocks and Assignment Grids in advance on a calendar. You can also “rotate” your Assignment Grids. The Format Scheduler gives you the ability to “override” your active assigned clocks for a pre- determined time frame for a date range, or perhaps for just one hour on a particular day. Just what you need if you would like to have different clocks in place for the holiday Monday coming up (perhaps you have a specialty weekend or count down planned, or simply will be voice tracked Monday) and need to have those clocks in place to export to your automation system.